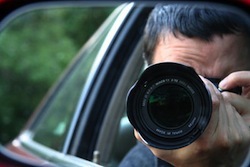 Should Injured Persons Expect Surveillance? An insurance company is a business entity and it is not going to spend money on surveillance where there is minimal property damage and the injury case can settle for $3,500.00. However, where there is significant property damage and the Plaintiff by his attorney claims a permanent personal injury which has greatly affected his life, such as limping or the inability to work, the insurance company will employ surveillance. The insurance company will seek to show the surveillance if it negates the injury claim to the injured individual's doctors and to the jury or judge in court. The standard upon which the courts will allow the surveillance is set forth in case law. So long as the videographer, i.e., the person who took the video, testifies that what is on the video is a fair and accurate representation of what happened, the recording can be admitted. The injured person should be aware that they can expect surveillance. For example, diving to catch a football will not make the insurance company believe you are injured (as one of my clients found out the hard way!) So always expect surveillance and have it prove your injury, such as a limp or other physical limitation. First ... we hold that upon request a party must reveal the existence of any surveillance information he possesses whether or not it is intended to be presented at trial. Second, we hold the contents of surveillance films and materials are subject to discovery in every instance where they are intended to be presented at trial either for substantive, corroborative, or impeachment purposes. Third, in limited instances, the contents of surveillance materials that are not intended to be submitted as evidence are subject to discovery if they are unique and otherwise unavailable, and materially relevant to the cause's issues. An example is a photograph of a scene which has been changed or cannot be reproduced. Fourth, with reference to our holding that a party is entitled to discover the existence and contents of surveillance information which will be used as evidence, it necessarily follows that the seeking party must be afforded a reasonable opportunity to view the surveillance information before trial. The surveilling party's failure to comply with such a discovery request will bar the information's use as evidence in the cause unless the trial court finds that the failure to disclose was not willful and either that no prejudice will result or that any existing prejudice may be overcome by allowing a continuance of discovery during a trial recess. Fifth, we recognize that there is some merit in respondent's contention that surveillance can prevent fraudulent and overstated claims. In this regard, fairness requires that we allow the use of surveillance materials to establish any inconsistency in a claim by allowing the surveilling party to depose the party surveilled after the movies have been taken or evidence acquired but before their contents are presented for the adversary's pretrial examination.